A suicide bomber has killed three people in the southern Israeli resort of Eilat - one of the country's most popular tourist destinations. 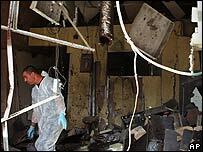 The explosion hit the Lehamim bakery in a residential area at 0940 (0740 GMT), killing the owner and two employees. Three Palestinian militant groups said they were behind the attack, saying the bomber was from Gaza but had entered the area via neighbouring Jordan. It is the first suicide bombing in Israel since April 2006. Police said the bomber had entered the shop carrying the explosives in a backpack. Witnesses described a massive blast which shook the area. "I saw a man with a black coat and a bag. For Eilat, where it is hot, it is strange to see someone walking with a coat. I said to myself, 'Why is this idiot dressed that way? '," Benny Mazgini, a local resident, told Israel Radio. "Seconds later, I heard a huge blast. The building shook." 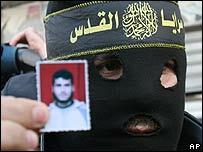 Three Palestinian groups - Islamic Jihad, al-Aqsa Martyrs Brigades and a previously unknown group called the Islamic Brigade - said they carried out the attack. They named the bomber as 21-year-old Mohammad Siksik from Gaza, saying he got into Eilat from Jordan - but Amman denied the claim. The groups said the attack was planned seven months ago and warned of more to come. Israeli Prime Minister Ehud Olmert vowed to continue fighting Palestinian militants. "We shall... instruct our security people to continue their ongoing and never-ending struggle against terrorists and those who send them," the Associated Press news agency quoted Mr Olmert as saying. Although the governing Hamas group was apparently not involved, its spokesmen have described the bombing as a "natural reaction" to Israel's actions in the West Bank and Gaza. A senior aide to Palestinian Authority President Mahmoud Abbas condemned the attack. "We reject these acts and we do not believe that they are in the interest of the Palestinian cause and that they blacken the image of the Palestinian people," Yasser Abed Rabbo told AFP news agency. The UN Middle East envoy, Alvaro de Soto, said: "It was an attack on ordinary people as they went about their daily lives. It can have no justification." The last suicide attack killed 10 Israelis at a Tel Aviv restaurant. Hundreds of Palestinians have been killed by Israeli forces in that time, mainly in the Gaza Strip.